Its a Wonderful Movie - Your Guide to Family and Christmas Movies on TV: Hallmark's latest Christmas Movies added to the 2018 List! Hallmark's latest Christmas Movies added to the 2018 List! Here's a review of the latest Christmas movies Hallmark has recently announced. Please keep in mind... any of the movies Hallmark shares, may end up on either the Hallmark Channel or Hallmark Movies & Mysteries, and they sometimes change them around as we get closer to the season! 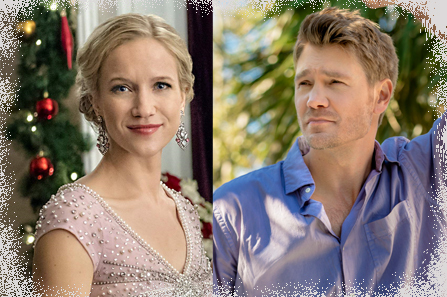 Chad Michael Murray (Hallmark Hall of Fame's The Beach House and Prince Charming from A Cinderella Story) is set to star in Hallmark's The Wise Men along with Hallmark alum, Jessy Schram (A Royal New Year's Eve and Cinderella on Once Upon a Time). So Prince Charming and Cinderella meet - at last! This new Christmas movie, The Wise Men, according to fanfest.com, follows a woman named Maggie (Schram) who is tasked with making sure that all three of her boss’s sons arrive home in time for Christmas. Things get a bit difficult when a huge blizzard hits, leading Maggie to convince her boss’s oldest son and co-worker Danny (Murray) to assist her in navigating this cross-country journey. Of course, romance ensues. "Hallmark Channel has ordered a When Calls the Heart Christmas movie to air later this year, EW has learned exclusively. Lori Loughlin, Erin Krakow, Jack Wagner, Pascale Hutton, Kavan Smith, and Paul Greene are among those actors reprising their roles in Hope Valley for this film, which will bridge seasons 5 and 6 of the Western family drama. Season 6 will premiere in early 2019." Hallmark Christmas movie starring Daniel Lissing (When Calls the Heart, A December Bride) and Brooke D’Orsay (Miss Christmas). via EW - Lowndes stars in Night Before Christmas as an event planner who heads to a small town to organize a holiday festival. There, she crosses paths with a Scrooge-y billionaire (Michael Rady) who is selling the estate that she wanted to use as a venue for her festival, and unlikely sparks fly between the two. For future UPDATES on Christmas Movies coming in 2018 - be sure to visit my Christmas Movie List! I saw this this AM, I was super excited :) Can't wait til Oct 26th. I love seeing your updates in my inbox. How exciting!!! Hopefully with having 36 Christmas movies....the quality will not be lacking due to so many. I noticed the past few years it has been. The Christmas movies I love the most seem to be from years where there were not as many. I do love Christmas and how a Hallmark tries to make it so Special. Thanks Net! How come you removed November Christmas & Silver Bells from your holiday schedule again? I was so disappointed last year, and they haven’t been on the July schedule again. Please reconsider adding them to the 2018 Holiday Schedule!! I believe your argument is with the Hallmark networks. Net only lists what they schedule, and in my opinion she does a fantastic job. I think last year both November Christmas and Silver Bells were on Hallmark Now which is their new pay-per-view service. gmp, I agree, it is disappointing to not see all of our favorite Hallmark movies make the schedule. With more movies added in each year, some are moved to the Hallmark Movies & Mysteries channel and others to Hallmark's streaming service. I know just how you feel, as I miss seeing A Season for Miracles. Thankfully, I have it on DVD, and I play it that way every so often. By the way, both movies you mentioned are also available on DVD! Last I checked, the prices were really good too! Paul, Thank you so much for your comment. You are so right, I have no involvement in the making of the schedule. I'm just the messenger! I am glad to hear that you enjoy seeing the schedule listings... thank you for your thoughtful compliment! I appreciate you putting in a good word for me! In regards to the movies, November Christmas & Silver Bells... you are right, those were moved to Hallmark Movies Now. As long as the schedule keeps filling up with new movies, I have a feeling many more of our dear old favorites will end up there, as well. Thank you, again, for your support! Lovin the look of these two together! Yay! Thanks for posting, Net! Thank you for keeping us updated on the Hallmark movies being shown. I just recently got the HM&M channel and can't wait for the christmas Season to start. Love Hallmark. Wonderful Clean stories...........Thanks again for all you do keeping us posted. Marianne, Thank you so much for your thoughtful, sweet message! It is my joy to share the spirit of the Christmas season - even in July! You are absolutely going to love the Hallmark Movies & Mysteries channel! Their movies are simply beautiful. Like you, I am so grateful for Hallmark's wholesome programming, that is done with heart and meaning. Chad Michael Murray's first Christmas movie with Jessy Schram. I hope to see him again in the future movies with Hallmark. Hallmark must have a good working relationship with Chad Michael Murray if they're casting him in a Christmas movie only months after his first Hallmark Hall of Fame movie! Something I noticed about The Wise Men is that Jessy Schram is also a Hallmark Hall of Fame alumni (she starred in A Smile as Big as the Moon in 2012)! Speaking of Hallmark Hall of Fame, have you heard any news about the upcoming Christmas HHOF movie? I assume they'll make an announcement at the Summer TCA event, but I haven't heard anything about the event either. Sally, I think you're absolutely right! Hallmark must know they have a good thing with Chad! I'm so glad to see he's doing more with Hallmark, and He will hopefully become an ongoing member of the Hallmark movie family! Jessy is so sweet in "A Smile as Big as the Moon." That movie is a unique one, a precious HHOF gem! I haven't heard, yet, about this Holiday's HHOF, but you never know, as you mentioned, what news the TCAs will bring!